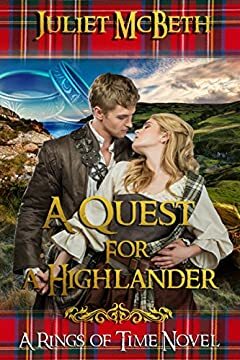 Juliet McBeth's exciting Novel - "A Quest for A Highlander"
Fraser McGregor, a battle weary Jacobite Highlander, rescues his brother from the Culloden Battlefield. Forced to leave his brother and help Bonnie Prince Charlie escape into the Highlands he meets the mysterious Cathy. Connected across time, drawn together by a magic neither knew existed. Were Fraser and Cathy meant to be together? Will she help him find his lost brother? Can she heal his breaking heart? Will she realise she has fallen in love with the Jacobite Highlander Fraser McGregor? A Quest for A Highlander is a complete novel not an introduction. I promise you a happy ending.